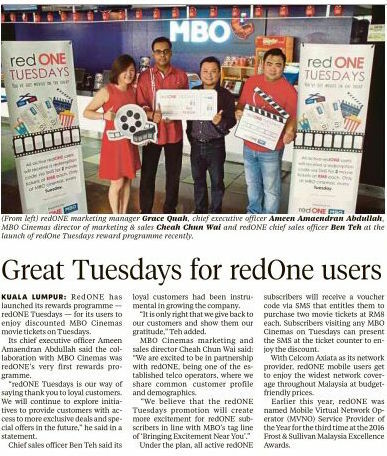 KUALA LUMPUR; redONE has launched its rewards programme - redONE Tuesdays - for its users to enjoy discounted MBO Cinemas movie tickets on Tuesdays. Its chief executive officer Ameen Amaendran Abdullah said the collaboration with MBO Cinemas was redONE’s very first rewards programme. “redONE Tuesdays is our way of saying thank you to loyal customers. We will continue to explore initiatives to provide customers with access to more exclusive deals and special offers in the future,” he said in a statement. Chief sales officer Ben Teh said its loyal customers had been instrumental in growing the company. “It is only right right that we give back to our customers and show them our gratitude,” The added. MBO Cinemas marketing and sales director Cheah Chun Wai said:”We are excited to be in partnership with redONE, being one of the established telco operators, where we share common, customer profile and demographics. “We believe that the redONE Tuesdays promotion will create more excitement for redONE subscribers in line with MBO’s tag line of “Bringing Excitement Near You”. Under the plan, all active redONE subscribers will receive a voucher code via SMS that entitles them to purchase two movie tickets at RM8 each. Subscribers visiting any MBO Cinemas on Tuesdays can present the SMS at the ticket counter to enjoy the discount. With Celcom Axiata as its network provider, redONE mobile users get to enjoy the widest network coverage throughout Malaysia at budget-friendly prices. Earlier this year, redoNE was named Mobile Virtual Network Operator (MVNO) Service Provider of the Year for the third time at the 2016 Frost & Sullivan Malaysia Excellence Awards.